Shown about 1.25 mi. N on right hand side of Primrose Center Rd. in 1890 plat. Notes: Religious services were held at the homes of settlers and in 1850 Rev. 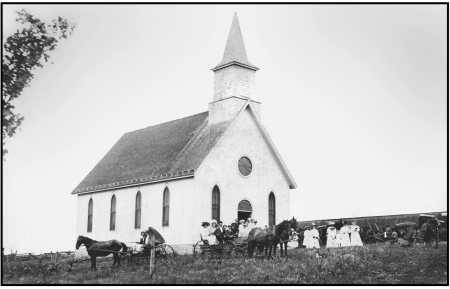 Elling Eielson appeared among the Norwegians and the Primrose Hauge Lutheran congregation was formed and a log church built on section 21. In 1915 it combined with the Primrose Norwegian Evangelical Lutheran Church becoming the Primrose Lutheran Church. The building is a combination using the bell tower from the Norwegian Evangelical Lutheran Church and the Hauge Church building. It was enlarged and moved to the new location in 1941.